1. A 'Live Suite' recorded at the Clinic, Germany, in February 2005. 2. Music composed from a library of approximately 200 paper sounds, also recorded at the Clinic. 3. Guest contributions. Please contribute! The tracks are mostly very different, one from another. So, if you have the time, please listen to as many tracks as possible -- there's bound to be something you like! It is important to remember that all the sounds you will hear come from paper sound sources. The majority of sounds are completely unaltered electronically, including many of the apparently non-paper sounds. However, some of the composers have altered some of the sounds, but often just by adding a little reverberation or by changing the pitch. In truth, paper is a material from which a remarkable diversity of sounds can be made, not all of which sound like our pre-conceptions of how paper should sound! If your speakers are somewhat puny, some of the tracks will sound distorted. The low rumbles and explosive 'Bangs!' heard on some of the tracks are difficult for ...er ...cheap speakers to relay without buzzing. As with all music, try to listen to Paper Music through quality speakers. A double track recording, with each track featuring 5-6 players. The sounds are made by holding large sheets of cartonboard or smaller sheets of card and vibrating or flapping them vertically in the air. Fans of the Australian/British entertainer Rolf Harris may recall that he used a similar 'Wobbleboard' on several hit singles in the 1960's. A double track recording, with each track featuring 5-6 players. The sounds are made with the traditional origami 'Banger! ', made in a wide variety of papers and sizes to achieve a variety of sounds. A quickly devised improvisation, made to explore the possibility of playing live to a beat. 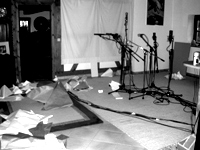 Constructed from a 'drum kit' of paper sounds, over which riffs and long sounds were layered. Using one 'click' sound and one 'wobble' sound (both with several pitch bends), the piece explores the limits of rapidity, repetition and contrast in Paper Music. Similar to the 'Wobble' live track, but more intense, dense and breathless. An attempt to make a track of awful beauty, that is both difficult to listen to and transfixing. A kind of Paper Music 'white noise'. musical piece. The biggest problem with "paper sound" is the lack of harmonic / pitched content, so I aimed for a more rhythmic approach, with splashes of atmospherics. with the final outcome - it has a quirky feel probably in keeping with my own character. The 'Live Suite' and 'Clinic Sound Library Compositions' are © Hangar 7, Salzburg and have been created in connection with “Masters of Origami” (July-September 2005) – an exhibition hosted by Hangar-7. Legal clearance to use the recordings for anything other than private listening must be obtained from Tom Wallmann (organiser of “Masters of Origami”), and from the individual composers. Other pieces are © the composer. It is permissible to sample any of the recordings to create your own Paper Music.